Paris of the 1770s and 1780s was an epicenter of political and social change. Fueled by the ideals of the American War of Independence, France endured a violent and cataclysmic revolution that temporarily purged the country of its monarchy and its hierarchical class system. St. Germain and Count Cagliostro gained entrée to upper class drawing rooms with alluring promises of quick wealth and eternal life. Mesmerist societies dedicated to magnetic healing popped up in towns across Europe, while intellectuals studied alchemy and joined secret societies like the Egyptian-flavored Masonic lodge founded by Cagliostro. While game players dropped the Tarot de Marseille (TdM) in favor of decorative Tarock decks, members of esoteric lodges were discovering that the TdM, with its ornate Italian suit cards and enigmatic trumps, was a book of wisdom bequeathed from the magi of ancient Egypt. In the hands of occultists, Tarot eventually became a device for organizing a large body of occult correspondences, and the TdM trumps were redesigned to illustrate these esoteric teachings. Occultism refers to a combination of Gnosticism, Alchemy, Astrology and Christian Cabala that came together in the Renaissance then percolated through the esoteric lodges of 18th century France. Tarot became part of this mix when occultists concocted fanciful stories of ancient mystical initiation rites performed in chambers lined with tarot imagery under the Egyptians pyramids. This new way of looking at Tarot was introduced to the public in 1781 when Antoine Court de Gebelin published an essay on Tarot in his multi-volume history of the ancient world, Le Monde Primitif. This essay is the first written document we have that corresponds each trump card to a letter of the Hebrew alphabet, and tells the story of the deck’s invention in ancient Egypt. Sixty years later, these ideas came to dominate tarot studies thanks to the enormous influence of the magician Eliphas Levi. Ettteilla (1738-1791) was a professional card reader and student of alchemy who designed a radically new deck that went further than any in re-visioning tarot as an Egyptian book of wisdom. He was aware of the Tarot-Qabalah connection, but preferred to emphasize astrology and hermetic literature in his deck, which didn’t look particularly Egyptian. The cards are numbered from 1 to 78, and the Trumps deviate from the standard TdM order. 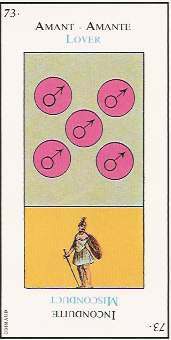 The Major Arcana cards have upright and reversed divinatory meanings in the margins. The minor arcana cards are divided into a yellow and blue rectangle, with suit symbols in the top blue segment, and additional symbols on the bottom. Etteilla is considered the first modern tarot reader. He was the first to use reversals, to lay cards out in spreads, to read the cards as a continuous narrative, and the first to publish divinatory meanings. He ran a school of astrology and tarot and published the first book on how to read tarot. Although Etteilla ran a tarot school, published correspondence courses, and had a loyal group of followers who continued his teachings after his death, his deck and his reading methods were too personal and quirky to become popular. His school eventually died out but his teachings still have tremendous influence. His divinatory card meanings greatly influenced the English occultists S. L. MacGregor Mathers and A.E. Waite, and they underlie the meanings of many Rider Waite Smith cards. Recently, paperback books on how to read with Etteilla’s deck have been published in France, so he may be experiencing a revival. In his 1870 book The History of Magic, Paul Christian described 78 Egyptian Tarot cards. In 1896, M. O. Wegener used these descriptions to illustrate a book on hermetic tarot by R. Falconnier. This seminal Egyptian deck is still published as the Egyptian Tarot by U.S. Games Systems Inc. The 1901 book Practical Astrology by Comte de St. Germain plagiarized Christian and Falconnier and served as the model for C. Z. Zain’s Church of Light deck and A.G. Mueller’s Egyptian Tarot deck. Wegener’s designs also influenced the 20th century Knapp-Hall deck, the Brotherhood of Light deck, and the Ibis deck which is a colored version of Wegener’s designs. In 1865, the professional card reader Edmond Billaudot drew an Egyptianized TdM in pen and ink based on Paul Christian’s writings. 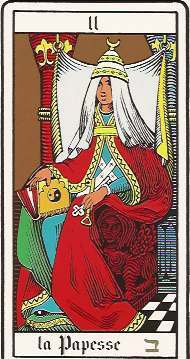 It’s currently published by Grimaud as Le Grand Tarot Belline. Occultists like Oswald Wirth and A.E. Waite added Egyptian touches to their decks to acknowledge Tarot’s perceived Egyptian origin. Eliphas Levi wrote one of the most influential treatises in the history of western occultism, Dogma and Ritual of Transcendental Magic, published in 1856. Levi’s synthesis of ceremonial magic, alchemy, Cabala and Tarot, based on the 16th century Christian Cabala of Athanasius Kircher, became the new paradigm for European esoteric and magical teachings. 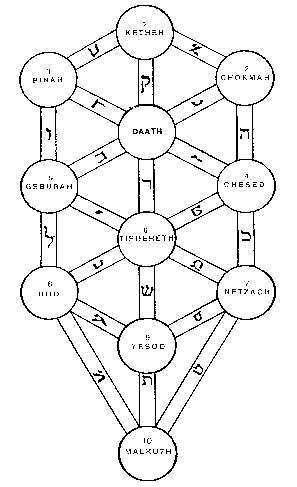 Levi associated each Tarot trump with a letter of the Hebrew alphabet and placed all 78 cards on the Tree of Life. His teaching that the four Hebrew letters of God’s name are supreme words of power was used a generation later by Papus as the basis for a complete system of Tarot correspondences. When Levi’s ideas migrated across the English Channel they were adopted with modifications by the Golden Dawn and became the bedrock of esoteric tarot in the English-speaking world. Levi’s Hebrew letter correspondences can be seen on many contemporary decks such as the Knapp-Hall, Oswald Wirth, Universal Dali, and Tarot of the Ages. 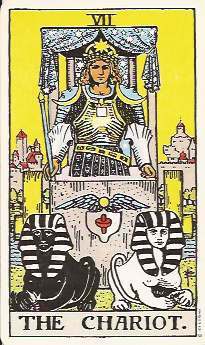 Levi’s card descriptions, which he claimed restored Tarot to its original Egyptian purity, had tremendous influence on the evolution of Tarot. 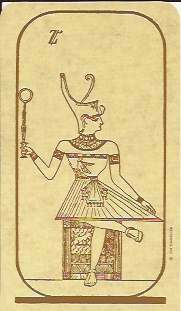 A. E. Waite incorporated many of these Egyptian flourishes into the Rider-Waite deck: the Empress with her feet resting on a crescent moon and the symbol for Venus on the card; the four suit symbols on the Juggler’s table; sphinxes pulling the Chariot; the High Priestess wearing the horns of Isis on her head; the square and triangle on the Temperance card; and the Devil as Baphomet. Oswald Wirth (1860-1943) who was born at the time Levi was writing his magical treatises, systematized Levi’s dense and confusing writings on Tarot. In 1899 he designed a deck based on Levi’s card descritions under the guidance of ocultist Stanislaus de Guaita. In 1927, Wirth published Le Tarot des Imagiers du Moyen Age (Tarot of Medieval Artists) his compendium of occult and cabalistic tarot illustrated with a slightly redesigned deck. A 1966 edition of the book by Tchou Editeur has a set of 22 cards enclosed in an envelope attached to the inside back cover. These cards were clumsily redrawn and re-colored and unfortunately have been the basis for all subsequent versions of the deck. Wirth’s writings are still the bedrock of European tarot studies and his influence is pervasive. When an English occultist visited Eliphas Levi in Paris in 1861, the result was a revolution in English occultism that led to the creation of the most influential tarot deck of the 20th century. 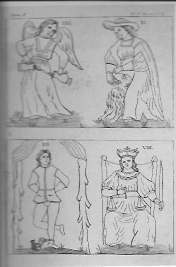 On the next page we’ll learn how Tarot crossed the English Channel.